Humans have been whitening fabrics for centuries; ancient Egyptians, Greeks, and Romans bleached materials. As early as 300 B.C. , soda ash, prepared from burned seaweed, was used to clean and whiten cloth. During the Middle Ages, the Dutch perfected the bleaching of fabrics in a process called crofting, whereby fabrics were spread out in large fields for maximum sunlight exposure. Textile mills as far away as Scotland shipped their material to the Netherlands for this bleaching. The practice quickly spread throughout Europe, and bleaching fields were documented in Great Britain as early as 1322. In 1728 a bleaching company using Dutch methods went into business in Galloway, Scotland. In this process, the fabrics were soaked in a lye solution for several days, then "bucked," or washed clean. The fabrics were then spread out on the grass for weeks at a time. This process was repeated five or six times until the desired whiteness was achieved. Next, the fabric was treated with sour milk or buttermilk, and again bucked and crofted. This method was lengthy and tedious, and it monopolized large tracts of land that could have been used for farming. The raw materials for making household bleach are chlorine, caustic soda, and water. The chlorine and caustic soda are produced by putting direct current electricity through a sodium chloride salt solution in a process called electrolysis. commonly used until around World War I, when liquid chlorine and sodium hypochlorite solutions—the forerunners of modern household bleach—were introduced. About this time, researchers found that injecting salt water with electrical current broke down the salt (sodium chloride) molecules and produced a compound called sodium hypochlorite. 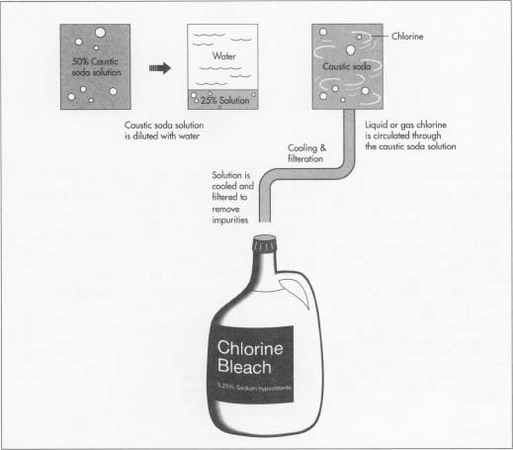 This discovery enabled the mass production of sodium hypochlorite, or chlorine, bleach. Excellent article on sodium hypochlorite. Thank you! we dilute sodium hypochlorite 12% with water to 5.25% and we fill it in one gallon container. our problem is after sometimes under high temperatute 40 - 45C the gallon blowing due to accumalation of gas. could you please help us to prevent this gas accumalation. Thank for this article! I ended up here after reading about the Carter Foundation helping citizens in Darfur to make their own soap and wondered how bleach came into the process. I need to make my own soap, so as to cut down on my expenses. This is the sort of history that should be introduced into high school chemistry class to increase the interest of female students. Some of my female friends did not listen to their mothers and burned holes in their clothes trying to soak them. My mother showed me a hole burned into a cloth by improper use. My ex-fiancee, scared of bleach from his experience in the Navy, messed up my whole laundry. I would not step outside the house without bleached white clothing. It smells so fresh. But anyway, an excellent article. I m just looking for reaction between hidrogen peroxide & caustic soda. This is the original method to bleach the fabric and is better as much than others cause you can obtain O3 free, per much the best chemical bleacher. First off, I am not a chemist, but I am a Texas state licensed water/wastewater facility operator and have experience in the field since 1980. I maintain chlorine & bleach injection systems, bottles, containers, etc daily & have had specific chemical handling training regarding those systems. In warmer climates such as mine, Sodium Hypochlorite (bleach) in any strength from 2.5% to 12% has a reaction as it breaks down called "off-gassing" where it converts to gaseous form. If not allowed to vent, it will expand in the container and eventually explode. It happens to me if I leave a container in the back of my truck and especially in the sun or on a hot day. My larger 300 to 500 gallon tanks don't have this problem because they have vent pipes on them. Your solution, (provided it is not hazardous to do so) is to simply not seal the gallon container lids tightly allowing the bleach to off-gas. I typically carry 3 to 5 one gallon bottles (store-bought) for emergency disinfection where needed and I open the screw on lid and puncture the sealed tab with a nail and put the screw on lid back on but not tightly sealed. This allows the gas to escape and the bottle doesn't swell or explode. Only problem with this is the bleach will lose potency quickly and after a couple of weeks and in my case not even smell like bleach or work as expected.